I know adult colouring books became popular quite a long time ago but it was really something that I couldn't get behind fully. I think mostly stemmed from my lack of staying within the lines. I mean I'm on a time limit here! You're rushing me and I can't colour in with this pressure. As much as I didn't think I would enjoy it I gave it a go a little while ago but I really didn't enjoy it. I think it was because I was so stressed and had so much to do that I felt like it was me wasting time. But now that everything has settled down and I find myself a little less busy I wanted to really give it another go. I noticed that I found myself with time on my hands and nothing to do with it. I was doing a lot of reading and watching Netflix but I really wanted to do something with my hands and feel like I was physically doing something (I don't know if it's just me that has this feeling, but I get it sometimes). I pulled out my old colouring book and borrowed a few pencils from my sister and got to colouring in. I felt like time flew by while I was doing this. I coloured in and kept on it and slowly through the days, I could see these pictures coming to life. My partner would comment on how much something would pop out and look at what I was colouring in now. Now I know what everyone was talking about. It's such a soothing art and as much as it sounds silly coming from a 25-year-old; I love colouring in now! It's something I highly suggest unless you have an assignment due or really important work to do because that stuff is not getting done! 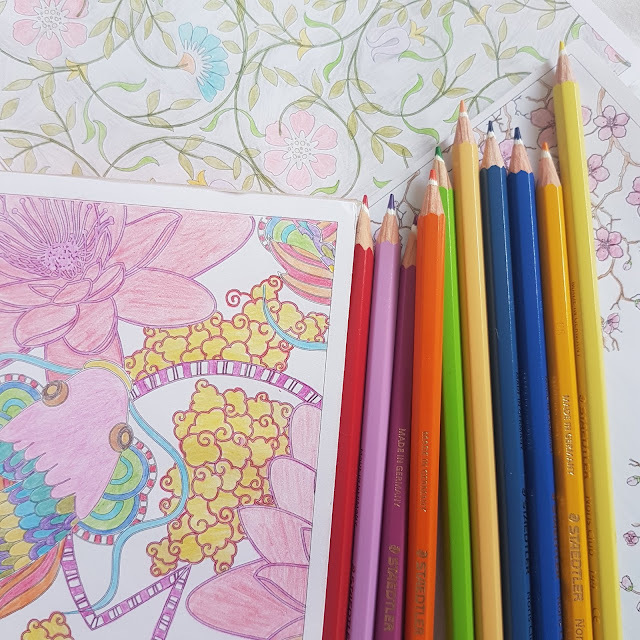 Enjoy your day everyone and make sure you check out Briony's post on adult colouring books here.